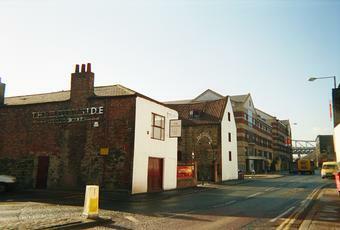 The Quayside was my final pub of 36 over 4 days in Newcastle. 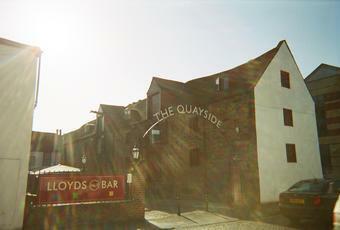 It's one of Wetherspoons' Lloyds bars and has a modern feel to it. Being quite late in the evening, it was attracting a younger crowd. Ale selection was limited to Greene King Abbot, Ruddles Best, Sharps Doom Bar, Sonnet 43 Abolition & Seraphim & Arundel Winter Knights. But a pint of Thistly Cross Whisky Cask rounded my evening off quite nicely. Visited this pub on a pleasant Sunday morning, with markets happening nearby and with the river & bridges looking magnificent. Everyone in northern England agreed with me & were out & about enjoying the day, so the pub was rammed. I managed to find a perch & had a pleasant pint of Doom Bar (2.55), getting served just in front of a big bunch of cyclists (all bulging obscenely in lycra) who hogged the bar & ordered a bewildering range of coffees & soft drinks. Despite the crowds I thought this pub an above average Wetherspoons. Who will rid us of this turbulent pub chain? Enough is enough. Had Erdinger on draught which I have not seen before in a wetherspoon. Ales were not so interesting though. Not as good as the Wetherspoon in Westergate on the beer choice. Have been in this pub on a number of occasions when visiting Newcaslte (when it has been both busy and quiet) and would recommend it for both food and drink. It features a pleasant atmosphere, efficient service, reasonably low prices, decent enough food and a good range of drinks on draught. The different draught largers I have tried have always been fine as well. The pub also has two beer gardens, of which the front one opens onto the river so this is not a bad place to spend a sunny afternoon.